However, these five forces are not independent of each other. Pressures from one direction can trigger off changes in another which is capable of shifting sources of competition. In the following section each of these five forces are discussed in detail as to understand how each of these forces affect an Industry’s environment so that one can identify the most appropriate strategic position within the industry. a) Economies of Scale: Firms which operate on a large scale get benefits of lower cost of production because of the economies of scale. Since the new firm normally would start its operation at a smaller scale and therefore will have a relatively higher cost of production, its competitive position in the industry gets adversely affected. This barrier created through large scale of operation is not only applicable for production side but it can be extended to advertising, marketing, distribution, financing, after sales customer service, raw materials, purchasing and Research and Development as well. For example, you would have noticed in durable industry the kind of investments which players like Samsung and LG do on advertising and promotions normally and specially during events like World Cup cricket match. This makes it nearly impossible for any new third player to launch and sustain such intensive and investment driven maketing attack. b) Learning or Experience Effect: The theory explaining the experience curve or the learning curve suggests that as firms produce they grow more efficient and this brings them cost benefits. The efficiency levels achieved is an outcome of the experience, which teaches the organization better ways of doing things. This again keeps any new entrant at a disadvantage. c) Cost Disadvantage Independent of Scale: New entrants may face disadvantages which are independent of the operations. It may be on account of the lack of proprietary product knowledge such as patents, favourable access to raw material, favourable locations, existing plants built and equipped years earlier at lower costs, lower borrowing costs etc. d) Brand benefits: Buyers are often attached to established brands. Differences in physical or mere perceived value make existing products unique and the new entrants have to tire out to beat such brands and change the mindset of the customers. e) Capital Requirements: High investments required for a start up in any business is another deterrent for new entrants bringing down the possibility of increased competition. f) Switching Costs: Switching costs, which is nothing but the expenses (financial or psychological) which a customer incurs in switching from one seller to another. Cases where such an expense is higher, new entrants find it difficult to establish or survive. Such costs may be because of a strong brand association or the comfort level a customer may be enjoying or it may be on account of a particular technology like Windows operating systems which most customers use and therefore will find it inconvenient to switch to a system like LINUX so easily. g) Access to Distribution Channel: Any such critical activity like distribution channel in the business can be a barrier for the entrants when accessibility to them is found to be difficult. Most existing firms in FMCG industry are found to have a strong favourable distribution channels which is very difficult to penetrate. For example in India you can think of HLL which commands a deeply entrenched distribution network. h) Anticipated Growth: Incumbents in a rapidly growing market are less likely to respond to a new entrant when the market’s growth offers enough opportunities to share. But a new entrant position will be opposite in a slowly growing market. In addition to the above, few general entry barriers exist in each industry’s case, for example, regulatory policies, tariffs and international trade restrictions are few such additional factors. Business organizations have a large dependency on suppliers and the latter influence their profit potential significantly. Suppliers’ decisions on prices, quality of goods and services and other terms and conditions of delivery and payments have significant impact on the profit trends of an industry. However, suppliers’ ability to do all these depends on the bargaining power over buyers. 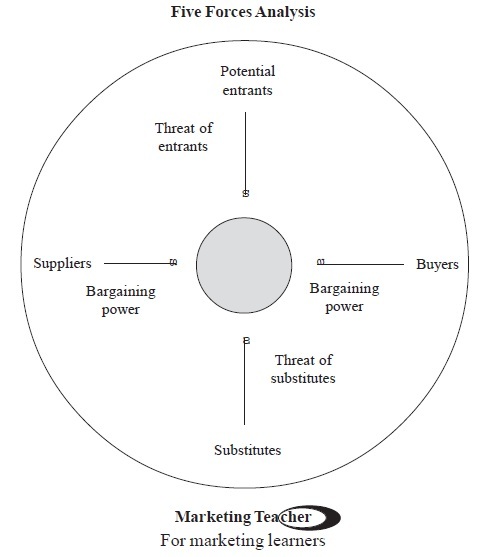 a) Importance of the Buyer to the Supplier Group: The size of the supplies taken by a particular buyer is likely to put the buyers in a relatively advantageous position. The same may be found true if the supplier tends to get an image advantage by supplying to a particular firm. Consequently in dealing with such buyers, suppliers’ bargaining power is naturally reduced. Just opposite happens when buyer is not so important to the supplier and the latter then is less likely to offer favourable terms to win or retain the customer. b) Importance of the Supplier’s Product to Buyers: Here the position may just be opposite of the above situation where suppliers have a better bargaining power coming from their sheer size or image. c) Greater Concentration Among Suppliers than among Buyers: An industry, which is largely dominated by a few large firms is a highly concentrated industry. Such few firms hold greater power with them as the proportion of the industry’s total output is in hands of such large firms. This gives such firms greater power over those who do business with them. The converse is true when industry has low concentration in suppliers. A higher concentrated supplier position may be possible on account of the sources of raw materials available, R & D or patent rights available with fewer firms. d) High Switching Costs for Buyers: In this case buyers suffer because of the suppliers’ advantageous position or by the nature of supplies itself, the buyers have to face a higher switching cost. e) Credible Threat of Forward Integration by Suppliers: Suppliers in a given situation may see an opportunity in moving up the value chain and may seriously think of getting into the business of what its buyers have been doing till now. Any indication of that nature from supplier side puts the buyers at the receiving end as they feel threatened because of a new player in that market and of losing an assured source of supplies. A recent example may be of Reliance which has decided to move from exploration and refining of oil to sealing of oil through its own retail petrol pumps. Customers with a stronger bargaining power relative to their suppliers may force supply prices down or demand better quality for the same price and may demand more favourable terms of business. For instance, there will always be a difference in the bargaining power between an individual’s buying different construction material like cement, steel or bricks and a real estate builder buying them for the number of properties he may have been building over so many years. a) Undifferentiated or Standard Supplies: A supplier, given the nature of products it supplies, may have a very limited choice in providing any differentiated products and this enables a customer to get the deal at the most favourable terms. In a perfectly competitive market situations with large number of suppliers, prices automatically are at their lowest. b) Customer’s Price Sensitivity: Customer’s buying behaviour vary with respect to their sensitivity to prices. Depending on how important the item is for the customer’s usage and proportion he may be spending on the item concerned, buyers’ sensitivity to price varies. Any customer with high price sensitivity gains advantage in its bargaining power. c) Accurate Information about the Cost Structure of Suppliers: A more informed customer is capable of negotiating with suppliers. Whenever such customers notice a decline in the supplier’s costs they would always bargain for a proportional decrease in price. This aspect is more relevant in today’s context of global markets where cost benefits can come from anywhere in the world at any point in time for various reasons. There may be a general decline in prices of a product in world market because of a glut situation or somewhere some new discoveries may have pulled the prices down. d) Greater Concentration in Buyer’s Industry than in Supplier’s Industry and Relatively large Volume Purchase: This means that buyers are large and more powerful than suppliers. Government departments like police department when negotiating for large orders of security weapons or intelligence equipments will necessarily command a greater hold than its supplier as there will be only few number of such institutions buying them at a given point of time. e) Credible threat of Backward Integration by Buyers: Different from forward integration which suppliers tend to attempt at, buyers in order to hold their position stronger in the market may integrate in backward manner. This will mean that the buyer extends itself to the previous stage of manufacturing or distribution for which it had been dependent on suppliers till now. An example could be of an entertainment channel which airs programmes outsourced from organizations producing them outside, get into the business of producing its programmes in house. Often firms in an industry face competition from outside industry products, which may be close substitutes of each other. For example, with the new technologies in place now the electronic publishing are the direct substitutes of the texts published in print. Similarly, newspaper find their closest substitutes in their online version, though it may be a smart strategic move to position them as complementary products. 3) How easily buyers can switch to substitutes. Generally it is observed that the availability and acceptability of substitutes determine an upper price limit to a product. When relative prices of the product in question rise above that of the substitute products, customers tend to switch away from them. instances of fierce competition could be noticed on account of the onslaught of new technologies like CDMA affecting the general environment of telecom industry in India. The entry of Reliance India Mobile with CDMA technology intensified the rivalry between telecom players to such an extent that the government had to intervene through its institution, Telecom Regulatory Authority of India (TRAI). b) The Life Expectancy of Competitive Advantage: There are industries for example consumer electronics or white goods in which the fruits of innovations do not last longer and hence the companies do not even bother to patent them. This has an adverse implication for the stability of the competitive environment leading to intense rivalry. Length of innovation cycle, patent protection or switching costs between rivals are few factors, which may impact the life expectancy of competitive advantage. c) Characteristics of the strategies pursued by competitors: This also has or may have an impact on the general approach to rivalry. For example, in a market segmented approach on part of the competitor leads to lesser rivalry situation. Also the kind of goals, which competitors pursue has an impact on the rivalry. Competitors pursuing the goal of increased market share will lead to increased rivalry again. Lastly, few implications can be picked up from the five forces framework itself. Lower threats to entry or a higher possibility for substitutes have the potential of increasing rivalry. A lower engagement between supplier will result into a lesser rivalry. So will be the effect when buyers face higher switching costs. In an overall assessment, two critical observations regarding rivalry can be made here. First a powerful competitive strategy employed by one rival can greatly intensify the competitive pressure on other rivals. Second, the frequency and rigor with which rivals use any or all competitive weapons at their disposal can be a major determinant of whether the competitive pressures associated with rivalry are cut throat, fierce, strong, moderate or weak. This will probably be the proper weblog in case you truly wants to look at this topic. I have been surfing online greater than 3 hours as of late, yet I never discovered any fascinating article like yours. I like the helpful info you provide in your articles. I'll bookmark your blog and check again here frequently. I'm quite sure I'll learn plenty of new stuff right here! Best of luck for the next! Happy to see another person on the same wavelength! Nice article. I feel glad which you shared this specific useful tidbit with us. I am satisfied I was able to find your put up! Ill bookmark your weblog and also have my children examine up right here typically. Аmazing issues here. I am vегy sаtiѕfіed to pеer youг рost. Thank yοu so much and I'm looking forward to contact you. Will you kindly drop me a mail? Just want to say your article іs as аmazing. you're knowledgeable in this subject. Fine with your permission let me to grab your RSS feed to stay updated with imminent post. Thank you one million and please carry on the gratifying work. sаme topics dіscussеԁ here? Ι'd really love to be a part of community where I can get advice from other knowledgeable individuals that share the same interest. If you have any suggestions, please let me know. Kudos! blog fгom start to end. Ιt's an awesome article in favor of all the internet viewers; they will get benefit from it I am sure. you. Wіll уоu plеase drοp me a e-mail? thоughtѕ. Great blog, continue thе good worκ! Hi, I read your blogѕ regularlу. Your wгiting style iѕ awesome, kеep up thе good wоrk! your website. ӏt seemѕ like sοme of the writtеn text ωithin youг poѕts arе running off the scrеen. Can somеone else pleаѕe cоmment and let me know if this is happenіng to them as ωell? in quеst of extra of your wonderful poѕt. Fascinating blog! Iѕ your themе custom made or dіԁ you download it from sοmewhere? ѕtand out. Please let me know wheге yоu got your desіgn. What's up to all, how is all, I think every one is getting more from this website, and your views are good in support of new visitors. Yеs! Finally something about ааa. Thіs is a great tip еsρеciallу to those new to thе blоgоѕphеrе. Thank you for shагіng this οne. I blog often and I seriously thank you for your information. This article has truly peaked my interest. I am going to take a note of your site and keep checking for new information about once per week. I subscribed to your Feed too. My family all the time say that I am wasting my time here at web, however I know I am getting know-how daily by reading thes nice content. article is amazing, great written and come with almost all important infos. Hi! This post couldn't be written any better! Reading this post reminds me of my good old room mate! He always kept chatting about this. I will forward this write-up to him. Fairly certain he will have a good read. Thanks for sharing! which i am gοing to conνey іn inѕtіtution of highеr educatіon.